A safe bathroom is not just important for seniors. Anyone can slip and injure themselves in the shower. The non-slip shower mats we are going to review in this buying guide are great for anyone. But I especially recommend them for seniors because of their extra-strong suction power. They are some of the safest shower mats you can buy. You can use them on the shower area, in the bathtub or any floor surface that constantly gets wet including the kitchen. But before we get to our favourite picks, here are some things to keep in mind when buying a good quality shower mat for a senior. When choosing a non-slip mat, make sure it has powerful suction to keep it securely attached to the floor especially when it’s wet. Non-slip mats use suction cups on the bottom side to hold onto the floor. Make sure there are enough of them depending on the size of the mat. An average sized non-slip mat should have over a hundred suction cups. Check that the mat has draining holes at the top. These holes prevent the mat from pooling water on its surface, which can be a trip hazard. The ideal size depends on where you want to place the mat. If it is just for a shower enclosure, you could do with a smaller size. If it is for the tub or an open shower area, you’ll need something with more coverage. The biggest non-slip mats measure about 1m by 40cm. These are ideal for a large tub or shower area. Medium-sized ones are 40-60cm long. These are great for smaller bathrooms. In some cases, you may have to trim the mat to get it to fit perfectly or avoid covering the drain. But some mats come with a notch left out for the drain. Where there is water, mould and mildew quickly follow. There is also an increased risk of fungal infections especially on the feet. When you are buying a non-slip shower mat, look for those with anti mould, mildew and fungal treatment. This will keep the mat from developing unsightly green or black spots and most importantly, it will keep the users safe from infections. Finally, check how easy it is to keep the mat clean. Can you machine wash it? Does it require any special care? How long does it take to dry? 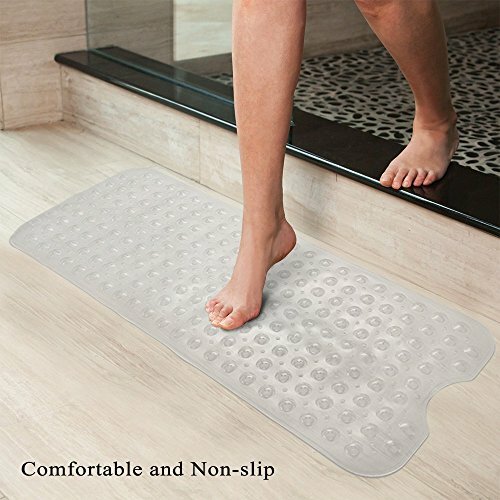 If you are looking for a full-length non-slip mat for the shower or mat, I recommend this one. It is 1m long and 40cm wide. On one end, it has an arc that keeps the mat from covering the drain. This ensures water drains faster, reducing the risk of slipping. There are also small holes on the mat to prevent water from collecting on the surface. On the underside, 200 suction cups securely grip the wet floor, providing maximum safety for seniors. The cups appear as small bubbles on the surface. They actually feel quite nice under your feet, providing some massage as you walk. The raised bubbles together with the soft textured surface ensure that the mat itself is not slippery. For one, you don’t have to worry about mildew and mould. The mat is treated with a substance to prevent their growth. To clean it, you just have to hang it up somewhere airy and let it dry. You can also machine wash it. Available in four colours: white, blue, grey and clear. Extra-large design with a notch for the drain. If you prefer something smaller and square, try this 55cm by 55cm shower mat. It’s perfect for shower enclosures and wet areas such as the kitchen sink area. For safety, it comes with 145 suction cups at the bottom plus draining holes to let water through. The suction cups keep the mat well secured on the floor but not too tightly that it’s difficult to lift it. Someone elderly can still manage to lift the mat for cleaning. The material used is anti-fungal and mould-resistant. 100% rubber – strong and durable. Resistant to fungi, mildew and mould. Includes draining holes that improve safety. This one measures 69.5cm by 40cm, making it another great choice for those looking for a small shower or bathtub mat. The mat has an anti-slip design both at the bottom and at the top. At the bottom, 112 suction cups strongly grip the wet floor to keep the mat from sliding. At the top, a network of miniature tiles increases friction between your feet and the mat, ensuring you don’t slip especially when the mat is wet. There are also drain holes that keep water from collecting on the surface. You’ll love how soft it feels under your feet. This is important if you are using it in the shower. You can stand on it for long without feeling any aches or fatigue on your feet. For cleaning, the seller recommends hand washing it with a gentle detergent and then rinsing with water. Made from a PVC material that is resistant to mould and mildew. Has drain holes to keep the surface from getting slippery. Tiled surface to improve safety. Another good choice for seniors who need a full-length non-slip mat. This one is 1M by 40cm long, making it perfect for large bathrooms, bathtubs, bathroom hallway and other wet-prone areas. It also has a convenient notch at the end for the tub or shower drain. The mat has 200 suction cups underneath that secure it to the floor and 176 drain holes that quickly drain water away from the surface. To keep it clean and mould-free, you can just hang it up to dry and occasionally throw it in the washing machine for a more thorough cleaning. Extra-long with notch for drain. This one is not as long as the Wimaha or Bligli mat but at 90cm by 40cm, it’s still big enough for most tubs and large shower areas. The mat has a beautiful pebbled design on the surface that looks great in the bathroom. The pebbles are completely flat so you shouldn’t feel any discomfort standing on the mat. Underneath are strong suction cup that grip the bottom of a tub or the shower floor. You can use the mat on any type of surface except metal and enamel tubs. The mat is mould and mildew resistance so maintenance is a breeze. Just let it air dry after every use and machine-wash it occasionally. Affordable especially for its size.